Arms weary from cleft oak paddles. Still two days journey away. Yet to be marked with a circle of rocks. New henge bank concealing modern secrets. In a warm evening breeze. As dogs, stir and yawn. Trussed and humped on a back. Space is made as fires glow. Before climb to flinted cliffs. First block is broken and rings round crags. Two by two to warm bodies. Ghostly fingertips impressed in stone. Whack and crack with river rounded hammerstone. Until too sore to bear. Calling home across the silver sea. 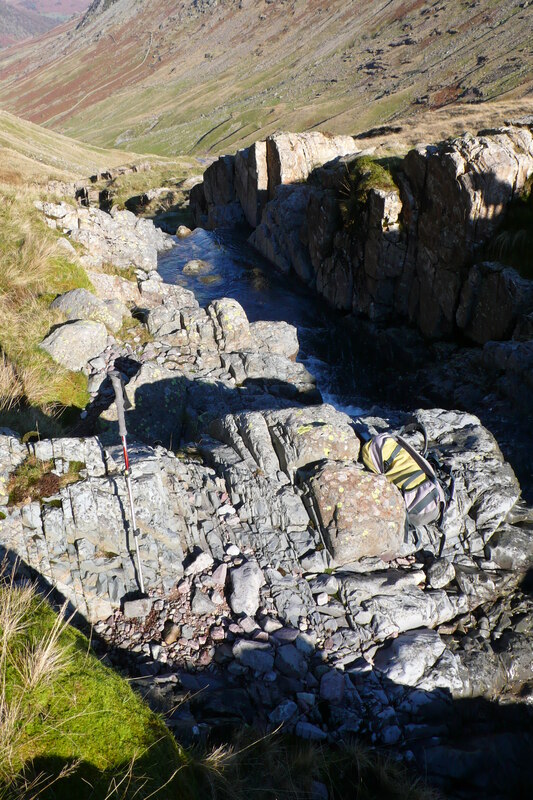 The reason for the journey in this case was to quarry the volcanic tuff from Scafell Pike to make stone axes, a rock known as Group VI that has very similar working characteristics to flint, subsequently polished to bring out the blue grey/green beauty of the stone. Exploring some of the aspects of journeys made by earlier Neolithic travellers inevitably throws up many questions, by their nature these expeditions would have been layered and multifaceted the focus shifting as the light crosses the changing landscapes and the world was explored by a still at least partly itinerant population on the cusp of a sea change in their lifestyles. Whilst the route described is just one possibility, it could equally have followed a ridge or been paddled along Wastwater, from a pragmatic perspective it seems likely that, to a degree at least, people would have followed the line of least resistance and as today would have been dependant on the vagaries of the weather in the Cumbrian Mountain. However there is also the belief systems at the time which may have dictated that a specific route needed to be followed, what I think is clear from anthropological comparisons is that knowledge of landmarks would have been vital in navigating around the landscape, especially in a mountain environment, these would have been primarily natural features but augmented as time passed with constructed features. Others such as Cummings & Johnston and Callaghan and Scarre have written at greater length on the differing aspects of prehistoric journeys and are there for the reading. For those less familiar with the archaeology of the Cumbrian landscape I will tease out some of the references in the text to places and some of the archaeological evidence that the narrative is based on, the relics of ancient industry and monuments. Whilst there is inevitably a degree of speculation in the interpretation of the archaeology in relation to place I have tried to keep it within the bounds of possibility! Middle Isle is the Isle of Man, a place with a melting pot of Neolithic monuments and also a quantity of Group VI axes which were clearly imported whether by trading or direct procurement as I suggest here. It is also an interesting Island in that it commands a view of Dumfries and Galloway, Cumbria, Snowdonia and the Mourne Mountains, I suggest that it was a kind of hub for Neolithic seafarers and as recent research on Orkney demonstrated quite possible to undertake such sea crossings. Perhaps an easier route than the North Channel and its strong tides. 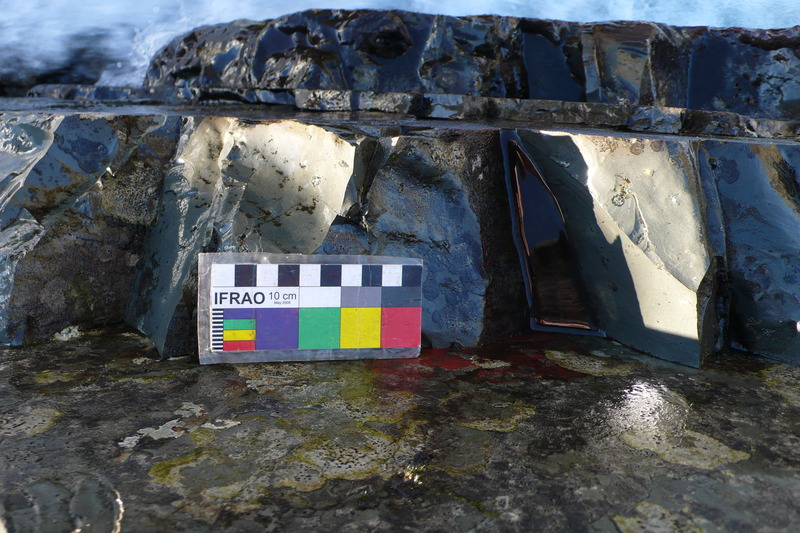 The axe tumbles a Ronaldsway axe from the Isle of Man was found near Seascale. 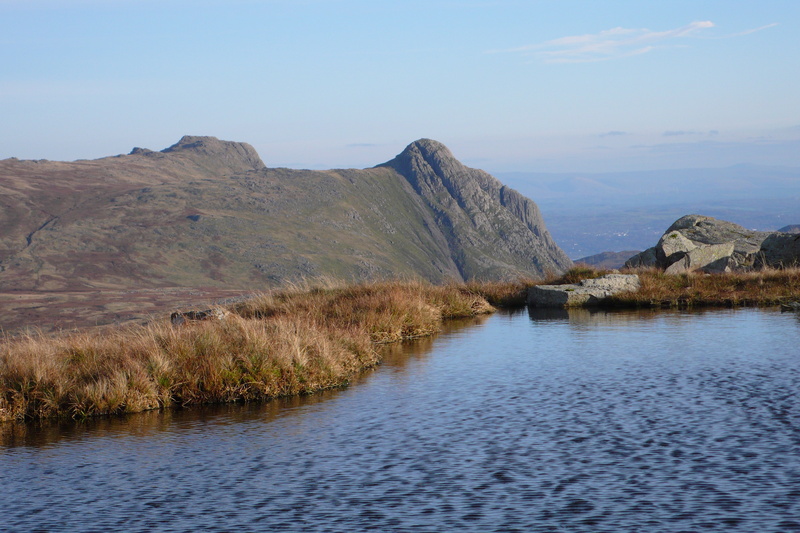 From the Isle of Man the col of Mickledore, between Scafell Pike and Scafell Crag gives the massif the appearance of a Cleft Mountain and therefore a prominent landmark to aim for from a canoe on the sea. Whilst the Cumbrian coast has receded since the start of the Neolithic period, about 6000 years ago, the rivers and streams were likely to have been in a similar position, inland at any rate. The circle of rocks is Grey Croft stone circle, Seascale a reconstructed stone circle, which commands a view to the Mountains and to the Isle of Man, where a broken Group VI axe was found. Although most stone circles are likely to have been constructed after the axe quarries had largely dropped out of use it is likely that the significance of the mountains endured if not in memory in myth and thus perhaps there was an element of taboo around these circles. It has been demonstrated through excavation that several stone circles were preceded by timber circles such as Oddendale and these were likely to have been important gathering places prior to that time, perhaps starting off as a clearing in the wood. River Camp is a site near Gosforth where a number of stone axes were found along with grinding and polishing stones during construction of the sewage works. Beach knapped is the local flint pebbles, up to fist sized, found on the West Cumbrian coast and used to make arrowheads and other tools. Banded Mountain is Buckbarrow a distinct band of rock crosses the crag and below is Tosh Tarn perhaps another Neolithic campsite like that at Ehenside Tarn. Farland: Ireland where many Group VI axes have been found despite more local sources of stone such as Tievebulliough, County Antrim. The climb up to Scafell Pike could have headed up towards Pikes Crag and the prominent Pulpit Rock (Signal Rock) via Brown Tounge, and the aptly named Hollow Stones, perhaps where the tuff was first prospected in the scree below the crag after being found in Lingmell Beck. There would have been considerable preparation necessary for a quarrying trip up the mountain, not least the need for shelter given the lack of caves or boulder shelters up there. Anchored with rock blocks: it is possible the two or three rectangular stone features, c 2x 3m, on the only patch of grass in this alpine environment at c 945m AOD to the east of the summit, are ancient bivouac sites where a hazel bender was erected and covered with deerskins. 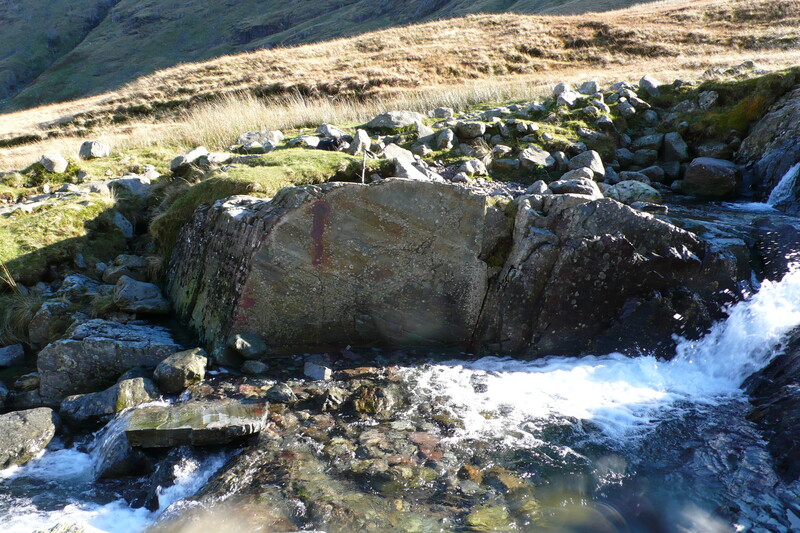 It is clearly a matter of speculation but interesting to ponder whether the cupules formed on the pock-marked rocks had any influence on the creation of prehistoric cup-marks made on domed rocks in the central valleys of the Lake District, man imitating nature, an example of skeuomorphism? Likewise, was there an element of replication in the construction of boulder cairns in imitation of the frost heaved circles found near the grassy terrace. It would be surprising if a mythology had not developed around working in such a dramatic and potentially dangerous place, as suggested by the siting of the quarries in Great Langdale many of which have a mainmast ambience, which would have been a good source of tales of daring in the face of danger and precipitous voids. The stone extraction pits are among a number of Neolithic features on the summit plateau of Scafell Pike, alongside numerous modern shelters, and are reminiscent of ring cairns yet were apparently created to lift blocks of tuff that had not been exposed to the effects of frost weathering. They occur in discrete areas which may perhaps suggest some sort of delineation of different “tribes” working up there. They clearly were used for flaking the stone down to rough-out stage as they contain numerous flakes in their base, but their exact use is debatable and there could be an element of deliberate structured deposition going on about these sites. Their locations were planned in detail by Claris and Quartermaine in the 1980’s although they had by then been disturbed to a greater or lesser extent by various people, known and unknown, they await an investigation with modern excavation techniques should anyone fancy some extreme archaeology. 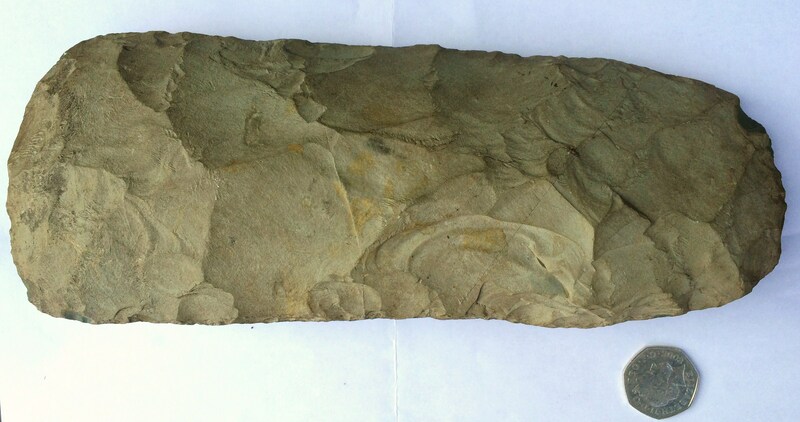 River round hammerstone: at stone axe working sites numerous river rolled hammerstones have been found that must have been picked from valley river beds and carried up the mountain. Callaghan, R, & Scarre, C. 2009. Simulating the Western Seaways. Oxford Journal of Archaeology 28, 4:357-72. Claris, P. & Quartermaine, J. 1989. 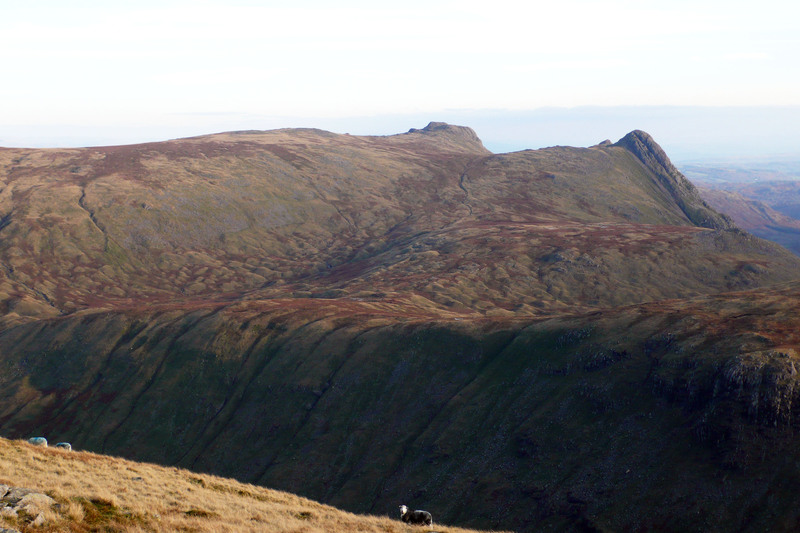 The Neolithic quarries and axe factory sites of Great Langdale and Scafell Pike: a new field survey. Proceedings of the Prehistoric Society 55, 1-25. V. Cummings & R. Johnston (eds.). 2007. Prehistoric Journeys, 54-63. Oxford: Oxbow. Garrow, D & Sturt, F. 2011. Greywaters bright with Neolithic argonauts? Maritime connections and the Mesolithic-Neolithic transition within the “western seaways” of Britain, c. 5000-3500 BC. Antiquity 85, 59-72. Taylor, S. 2016. Journeys to Neolithic Langdale: how a Cumbrian landscape may help explain prehistoric movement of polished stone axes. Lithics: the Journal of the Lithic Studies Society 37: 15–32. Waterhouse, J. 1985. The Stone Circles of Cumbria. Chichester: Phillimore & Co.
Says a farmers wife to the farmer “should we show him our treasure” a minute later, on cue an axe emerges from a Morrisons carrier bag wrapped in bubble wrap, its home in recent years. This is a big one! Quarried a few miles away or even closer, it emerged one day form the fill of a drystone field wall that had rushed. Fortunately, as the farmer said, his wife was on hand to recognise that the hand of man had been at work here, stopping him chucking it back into the fill of the wall from whence it came. But before it was built into this wall where had it been? In the field perhaps, ploughed up like so many other axes hereabouts and picked up by the ploughman following his horse and tossed to the side of the field eventually to be built into the wall when the mass enclosures were in full swing and walls were being built in the blink of an eye or two. Before that; perhaps it was lost, left or buried. An offering back to the earth from where with fire and water with stick, stone and bone it had been split from the rock face high in the mountains. Now we value the object for the histories it holds within it. Others will value it for the the cash they can make out of it, much greater than its scale; offering it to that modern god, ebay. Note: I came across this rough-out axe as I was asking leave to walk some fields surveying for rock art, not quite what I was expecting to find; however later in the day I did find a new cup-marked slab, a god day all round! Locally a wall rushing is an apposite descriptive term for the collapse of a drystone wall. This is most probably a Group VI Cumbrian Axe. 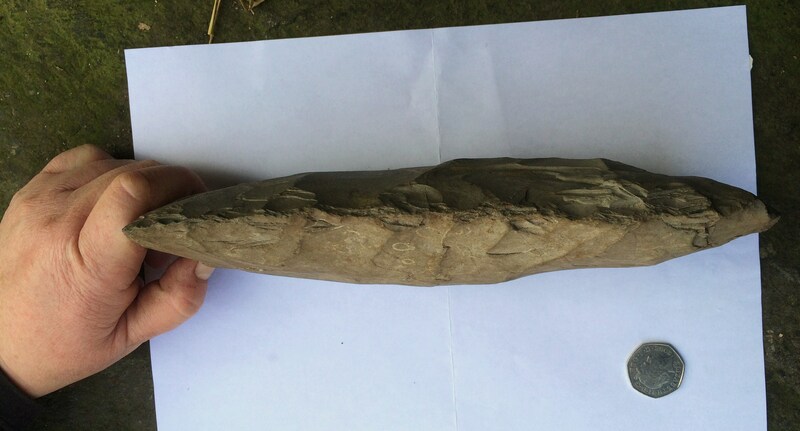 Its broad blade suggests it may have been intended as an adze. Other axes that have been polished and are of these proportions have been found within Cumbria notably one found at Mechi Farm near Aspatria comes to mind. These are different to the thinner butted and waisted iconic “Cumbrian Club’s”, it is possible that these morphological differences could relate to differant social groups rather than purely functional, but that is perhaps the subject of another blog. This week I start in distant lands with mountains obscured by clouds. In 1938 mountaineer Heinrich Harrer was part of the team to first ascend the North Face of the Eiger. He was interned in India during the war escaping in 1944 where he made his way into Tibet, a tale told in “Seven Years in Tibet” where he became an official in the Tibetan Government and personal tutor to the Dalai Lama. On his return from Tibet he resumed his mountaineering activities and in 1962 led an expedition to Papua New Guinea to climb the Carstenesz Pyramid he had heard of before the war. 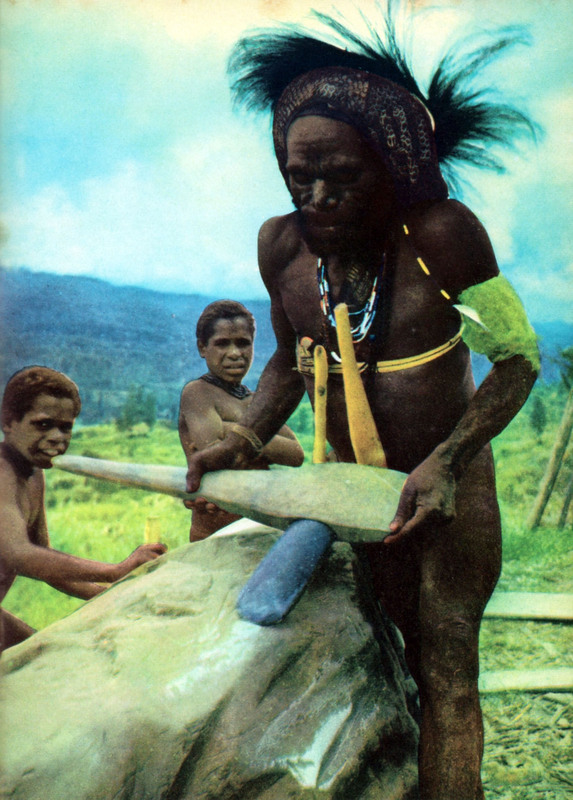 Harrer was fascinated with the tribes he met in Papua New Guinea and wrote a compelling account of his experiences in “I Come From the Stone Age”. Whilst here he met the Dani people of the Baleim Valley in the Western Highlands and was the first westerner to witness the journey to Ya-Li-Me on the Kiembe River, the Andiba rock quarries, used for axe making. Excitement amongst the Dani men mounts on reaching Ya-Li-Me beside the river; a men only affair as it was taboo for women to visit this place. They then set about building wooden scaffolding up the rock face using twenty-foot poles with great gusto in a haphazard affair and laying slabs of stone on this on which they set a fire abutting the rock face. After some unsuccessful attempts at splitting the rock Harrer was asked to light the fire, as he was now called Ya-Tuan the Stone-Axe Gentleman, and with some ritual, which included a lump of rancid pork fat, he lit the fire. Fortunately this fire had the desired effect and the performance of knapping axes started amid great enthusiasm and injuries which were treated by the expedition doctor, I could go on but you should read the book! It is fascinating to think that from the Early Neolithic around 6000 years ago,even here in Cumbria people like the Dani, were wandering the high fells prospecting for a specific type of rock from which to make their own axes. One wonders how they did this, were they systematic, following the crags and their scree like their later day explorers Bunch, Fell and Plint; or was it a random affair? Now as I trudged down from my last expedition, subject of my previous blog, I noticed some conchoidal fracturing on blue-green Seathwaite Tuff bedrock here where the glacial deposits had been stripped away. Feeling in need of sustenance I resolved to return another day to take a closer look, to see whether the hand of prehistoric man had been at work here. 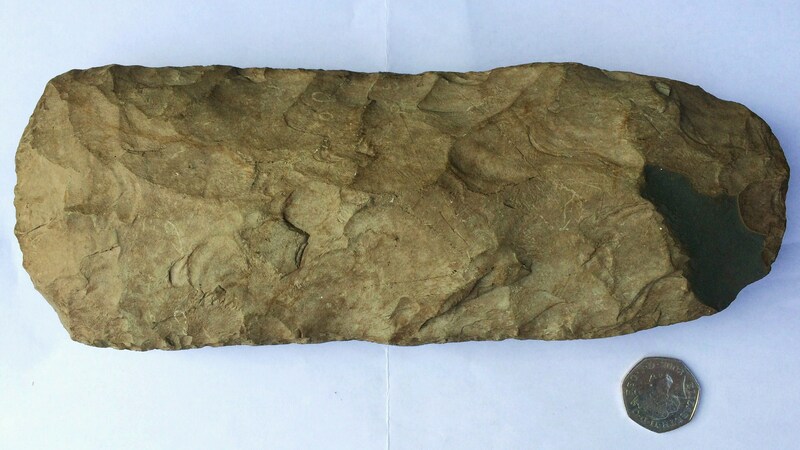 Conchoidal fracturing means that when struck the rock fractures leaving a scallop shell-like shape on the parent rock; the resultant flake will be the obverse shape with a bulb of percussion on the end nearest the blow. 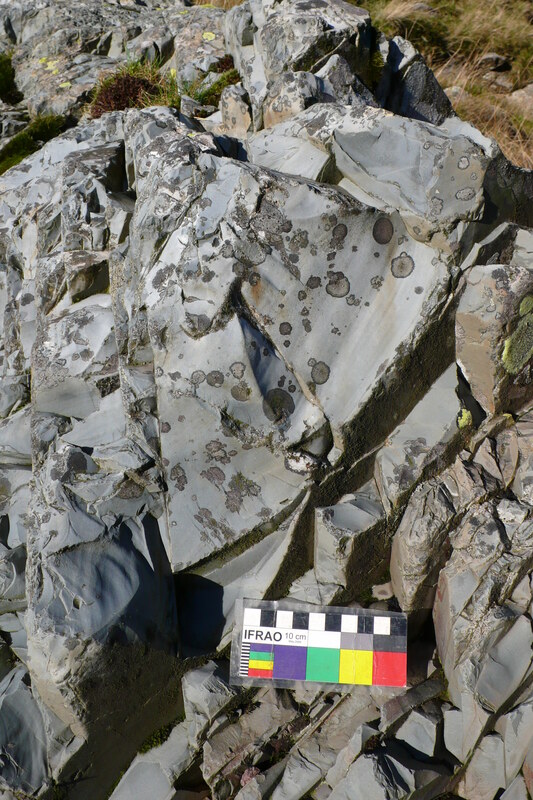 Now this fracturing can happen naturally when rocks tumble over each other but also when struck repeatedly by stone hammers; the challenge is to differentiate the two. So, like the latter-day prospectors following mountain streams searching for mineral veins, did the prehistoric people first spot the exposed tuff in the ravine sides or see pebbles of tuff in the streams that had washed down from the mountains and track them upstream to locate the “mother lode”? Indeed as the hard tuff makes for obvious near vertical crags this was almost certainly another landmark the ancient people used for spotting likely outcrops. It was in fact likely that these keen-eyed “first fells-men” used all these methods making trail knaps of rock as they went, some of the early sites identified at Great Langdale were next to Stake Beck. On return to Ruddy Beck it was apparent that where rocky ridges cross the beck there that had been some hammering going that had formed two unnatural notches in the ridge; the rucksack lies in one with the other larger one to its left. There was little water wear apparent and they were well above the water level after a night of heavy rain. 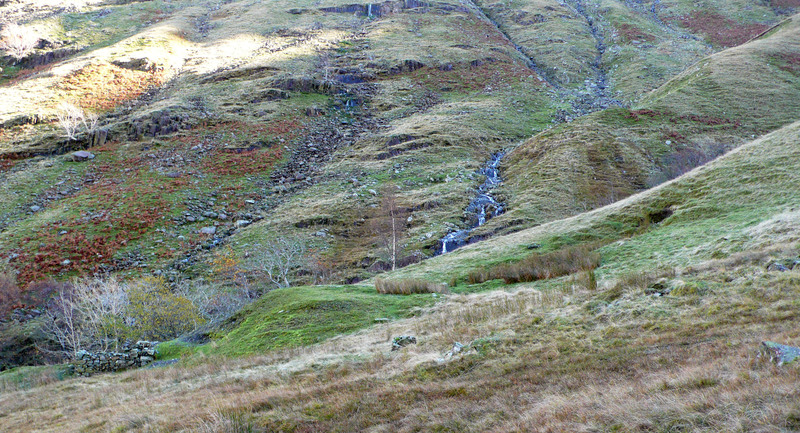 This particular site appears to have been overlooked in the surveys undertaken since the stone axe workings were first located in the 1940’s and those in the 1980’s by Reading University and Lancaster University Archaeological Unit; whilst discovering working sites on either side of the Seathwaite Valley on the same strata. Using the combination of archaeological evidence and ethnographic analogy Bradley and Edmonds were able to establish that fire had been used to crack the rock prior to extraction at the Neolithic quarry faces on the crags of Pike O’Stickle.This work would have been aided by timber levers and wedges made from wood and cattle bone it is also likely that water was used in this process; these facts are hard to establish from the archaeological record when the acid soils are also taken into account. Now that there would have been a more accessible supply of both timber and water at Great Langdale than the higher, drier and treeless Scafell Pike is perhaps another reason why the quarrying developed on a larger scale here; thus becoming the first Lakeland Industry, it’s a thirsty job being a quarry worker! Here at Ruddy Beck we can see how the rock fractures off neatly along the bedding planes that have been tilted vertically here, this would make working down the rock into manageable blanks relatively easy. Now whether many of these slabs have been removed by man or nature is hard to say; any spoil that fell into the stream would now be at the valley bottom. However it is quite possible that several may have as we can see flaking scars on the upper surfaces of an in-situ vertical slab adjacent to the right – perhaps like the Dani tribes-men they lit fires against it on stone platforms set in the beck bottom. Were they flaking the rock to divert the water whilst they quarried the rock or just altering the land, are there flaking sites under the turf or is it a trail extraction site? Many questions, further investigations are required! More about Great Langdale can be read in the excellent volume by Richard Bradley & Mark Edmonds, “Interpreting the Axe Trade” and Mark Edmonds’ book ” Langdale”. The most recent survey of the area was by Phillip Claris & Jamie Quartermaine, published in 1989 in the Proceedings of the Prehistoric Society. P.S. 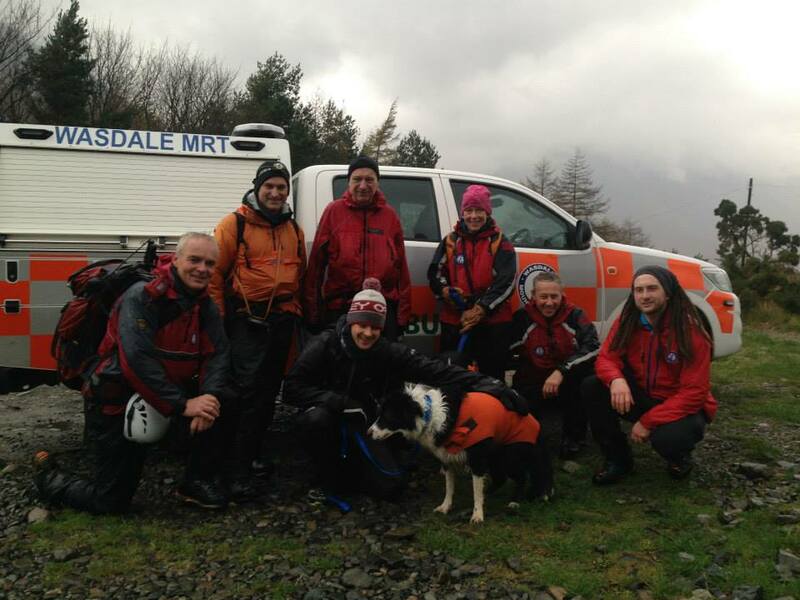 As I compose this a collie has been reunited with his keeper, Adam, after four nights lost on Scafell Pike. This has touched a lot of people…and returned from the misty spirit world …the dog god? Welcome back Jasper!